To Cite: Nafei A, Ahmadzade A, Sakha S, Bqay N, Mustafa Soltani P. Survival After Long-Term Cardiopulmonary Resuscitation Through Receiving 55 Times of Defibrillation Shock, Crit Care Nurs J. 2016 ; 9(2):e6254. doi: 10.17795/ccn-6254. A 46-year-old man with severe chest pain without a clear medical history of cardiac ischemia was admitted to emergency ward of Ayatollah Madani hospital in Khoy city, Iran. The patient was diagnosed with possible acute coronary syndromes and located in the first level of triage. After early interventions in the emergency ward, he was transferred to the coronary care unit. After half an hour, the patient was suffering from primary ventricular fibrillation. Advanced cardiopulmonary resuscitation (CPR) was started without delay, then the patient survived after three hours of receiving CPR and 55 times of defibrillation shock. Cardiac arrest following ventricular fibrillation is a medical emergency. In the case of the possibility of patient’s survival, correct treatment should be performed as soon as possible. Interventions such as rapid chain of survival including early identification, asking for help, beginning rapid cardiopulmonary resuscitation (CPR), faster defibrillation and postresuscitation cares should be considered (1). Primary ventricular fibrillation happens following acute myocardial infarction, which is with a history of heart failure or cardiogenic shock. In more than 10 percent of the patients, this dysrhythmia happens with chest pain due to myocardial infarction during first hours of hospitalization. Factors related to this rhythm include young age, being male, smoking, low levels of potassium and inferior myocardial infarction (MI) (2). Ventricular fibrillation and ventricular tachycardia are considered the initial general rhythms in cardiac arrest. Recent studies regarding CPR have indicated the importance of faster beginning of defibrillation in hospital. Defibrillation is the only treatment for cardiac arrest and increases survival 2 - 3 times depending on the start time (3). Patients with acceptable rhythm for shocking, in the case of achieving fast defibrillation shock have better prognosis (4). In order to have better efficacy of CPR in cardiac arrest, it is necessary to perform it stage by stage (5). Also, effective cardiac massage is necessary for better efficiency of brain neural function; using rapid defibrillation is usually important in ventricular fibrillation and ventricular tachycardia. Causes of cardiac arrest should be assessed after successful CPR and rhythm return, and the patient should be transferred to intensive care unit (ICU) (3). 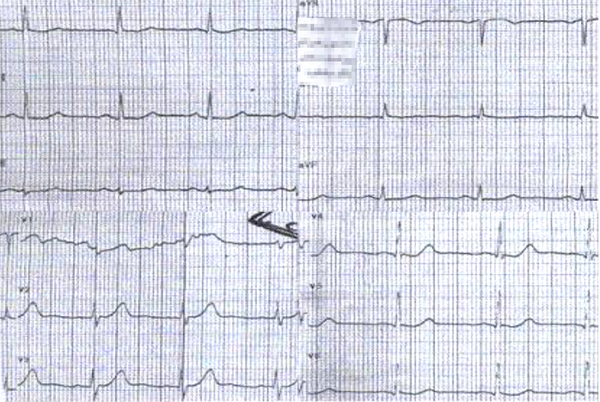 A 46-year-old married man was admitted with the main complaint of chest pain with 9.10 degrees of intensity on the scale of measuring pain in emergency ward of Ayat-allah Madani hospital in Khoy city, Iran, with a diagnosis of acute coronary syndrome. Immediately early diagnostic and therapeutic implementations such as putting the patient in the first level of triage, observing complete bed rest (CBR), controlling vital signs (V/S), taking IV line, controlling patient’s pain through intravenous injection of pethidine ampoule every five minutes, controlling a 12-lead electrocardiography (EKG), cardiac monitoring, obtaining necessary tests, performing necessary drug instructions and visiting the on-call cardiologist were carried out. The patient had a history of hypertension and fatty liver without using drug, and in controlling V/S BP = 90.60, in assessing the first EKG, the rhythm was regular; the rate was about 85; except that, T wave sizes in leads V4, V5 were almost the same as R wave height. Also, there were no symptoms indicating ischemia (T wave inversion and ST segment depression), infarction (ST segment elevation and ST segment depression) and heart block (Figure 1). Due to complaining of pain, the patient took pethidine ampoule (25 mg) every five minutes. After patient’s relative stabilization, patient was transferred to CCU accompanied by experienced nursing staff for continuing treatment and nursing measures at 7:45. Due to suffering from pain and lack of clear EKG changes because of differential diagnosis in terms of aortic dissection, emergency EKG was taken from the patient, which was reported normal by the on-call cardiologist (EF = 55%). Half an hour after admitting patient in CCU, the patient was suffering from pulseless ventricular tachycardia (VT) with disturbance of consciousness. Immediately, Advanced Cardiac Life Support (ACLS) measures were started simultaneously with announcing code 114 (the announcing code of the hospital resuscitation team), these measures included two hundred joules biphasic cardiac defibrillation shock, beginning infusion of amiodarone (300 mg), cardiac massage at least 100 times per minute for two minutes. Epinephrine were used according to the CPR protocol and the rate and rhythm were controlled within 10 to 15 seconds; due to failure of rhythm return, defibrillation shock and resuscitation operation had continued and the patient was intubated. Defibrillation shock should be used every two minutes to control ventricular fibrillation (VF). Following the results of tests and abnormal findings k = 28, continuing amiodarone infusion was stopped and due to the risk of dysrhythmia (Torsades de pointes), magnesium sulfate and potassium chloride were used. Patient’s VF rhythm was changed to sinus rhythm after about three hours of CPR and receiving about 55 times of the carcinogenic shock. By returning V/S to the normal range, the patient was transferred to ICU for controlling hypoxia and after two days of hospitalization and stabilization, he was sent to Tabriz city, Iran, for angiography. Despite the great efforts of different CPR associations, survival rates from cardiac arrest were low. The survival rate leading to discharging from the hospital was 15.3% to 37% (6). Nurses are usually the first responsible health care staff and beginners of CPR until resuscitation team arrival (7). Identifying the initial rhythm is very important because time is important for survival in cardiac arrest due to ventricular fibrillation or tachycardia without pulse (6). Initial defibrillation shock is the main key for increasing the survival rate (3). All the nurses should be qualified for diagnosing pulseless fibrillation and ventricular tachycardia; they should be able to do the defibrillation shock during few seconds before resuscitation team arrival (6). Preventing cardiac arrest in hospital requires training in CPR, monitoring patients, identifying signs of worsening patient’s symptoms, benefiting the resuscitation team and effective actions (8). Effective CPR and faster shock for treatable dysrhythmias are the basis of initial and advanced CPR. Effective CPR is very important. Cardiopulmonary resuscitation is effective when chest massage is carried out non-stop during CPR with a ratio of at least 100 cardiac massages per minute with the depth of at least five centimeters along with giving chance for chest return to its initial state. Stopping massaging should be avoided until the device full charging; effective chest massage is in priority compared with artificial respiration. When the rescuer is alone, the respiratory rate is 6-8 per minute in intubated patients and 30 cardiac massages and 2 artificial respirations should be carried out in nonintubated patients, in addition hyperventilation should be avoided (9). Defibrillation shock is the crucial treatment and the only effective approach for VF. In the case of accessing to biphasic wave type, using this device due to its high success is more preferable than the monophasic type. The amount of early shock in adults of biphasic type should be 120 to 200 joules and in monophasic type should be 360 joules (10). In the absence of reforming dysrhythmia after one shocking or two minutes of CPR, epinephrine (1 mg) should be used every three to five minutes simultaneously along with performing CPR. Using dysrhythmia drugs such as amiodarone (300 mg intravenously and repeating the next dose 150 mg intravenously), lidocaine (1 to 1.5 mg/kg intravenously, then 0.5 to 0.75 mg/kg every 5 to 10 minutes) and magnesium sulfate (two grams intravenously and infusion if necessary) after an unsuccessful effort after the second defibrillation are considered in preparing the third shock (11). Cardiopulmonary resuscitation training with the latest instructions is done for the nursing staff of Ayatollah Madani hospital. The result shows that the survival chain has been observed during ACLS measures and long-term CPR can be useful. Controlling a patient in terms of cardiac dysrhythmia in the early hours of hospitalization in CCU is one of the important roles of ICU nurses. The patient’s cardiac and vital signs were monitored immediately. Benefiting qualified, experienced and educated resuscitation team during CPR process, presence of an on-call cardiologist at the bedside, cardiac massage at the proper depth, the rate at least a hundred beats per minute, changing massaging staff every two minutes, defibrillation shock to the required number, availability of the shock device, systematic use of the drugs during CPR and assessing the underlying causes and removing them (controlling hypokalemia in this case) were effective in the achieved results. Observing survival chain during advanced CPR, nurses’ knowledge of the latest algorithms, defibrillation shock to the required number depending on the patient’s response and benefiting appropriate equipment are considered as the important factors in successful CPR. We would like to thank and appreciate the resuscitation team of emergency wards and CCU of Shahid Ayatollah Madani hospital in Khoy city because of their effort in conducting successful CPR.